I was in the mood yesterday to do some second-hand store trawling, but I've been to our local Salvo's (Salvation Army) recently and there's never much there. So I caught a bus to the Salvo's in Brunswick East, which someone recommended. First, I found a pair of daimty purple and black heels, in my size, which might be just the thing for Amy and Diana's wedding. Then I found some melamine souvenir ring dishes from Malta. One in particular caught my eye and I figured I could use it on my dresser to hold all the random bits that inevitably collect there. It has a photo of a sunshiney scene with palm trees. That makes me happy. Then I found a knit sweater that I thought was rather ugly, but which was made with a cool rose-and-metallic yarn that is just what I've been looking for! 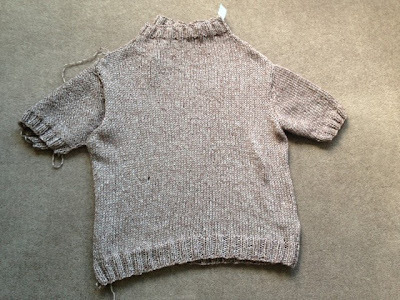 I've been seeing lots online about unpicking op shop sweaters to recycle the wool, so I've had my eye out lately. Patons has a great chunky wool with metallic bits called Stella that I quite like, but the balls are $7.99 each. While that's actually really cheap for yarn, it still means I'd have to pay about $60 for enough to make a sweater. 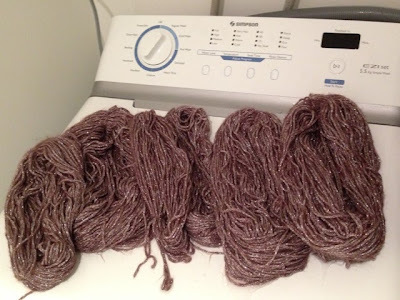 But here was a sweater's worth of metallic yarn for $6.99! I couldn't pass that up. This sweater was actually hand-knit by someone. It doesn't have manufacturer's tags or anything, and that hole on the front is an error, not a rip. It made me feel a little bad undoing it, but the maker (or recipient?) obviously wasn't very happy with it, and I am providing an opportunity for it to be reincarnated. Lots of love surely went into it, and it deserves to be pretty and appreciated.